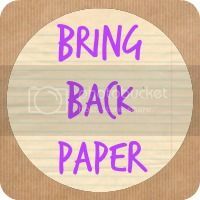 Share the post "#BringBackPaper – A Look Back"
I started my #BringBackPaper campaign at the start of April this year and I’ve absolutely loved it. It’s all about enjoying and celebrating paper, whether that be snail mail, books or gorgeous stationery, I’ll cover it! If you fancy writing letters again, find out more about PostCircle. Want to know more about Smashbooking? Smashbooking Inspiration. When writing and journalling becomes a kind of therapy, in What My Pregnancy Journal Means to Me. Do you take a moment to stop and reflect on the book you’ve just read, before moving on to the next? I didn’t, but I do now I keep a Book Journal. And on the subject of reading, How Do You Read Yours? If you’re looking to 2015, here’s some pretty stationery to help you get organised. Next up, there will be a Papery Peep on New Year’s Eve. I plan to share any new papery goodies Boo and I receive for Christmas, so am hoping to peek at lots of other pressie piles, too! Or if #BringBackPaper has inspired you in some way this year, please do go ahead and share that with us and link up. I do love to Peep! Looking forward to next year, I’d like to continue to share papery guest posts, feature a great range of stationers, run Instagram challenges, book swaps and Papery Peep monthly. New ideas for the campaign include featuring a regular showcase of favourite products, starting up a new challenge (keep your eyes peeled for details on that one soon! ), more papery swaps and quick and simple activities to get involved with. Oh, and if I get enough interest, I’d be happy to have another Twitter party, too, as I did enjoy hosting one of those. And then it’s over to you. What would you like to see? Any features that you enjoy, anything you’d like to read about or have you got a burning idea you’d like to share? Please do! Hope you’ve been enjoying this series, too, and here’s to making it bigger and better in 2015. How inspirational! Just seeing pictures of beautiful stationary simply makes me want to sit down write now and write a letter, but like many I don’t have anyone to send a letter to. I love the postcircle idea and will think about joining. I would love to have some interesting post once in a while! New years resolution is to contribute more and join a snail mail collective like #postcircle. Thanks so much Jocelyn for starting and sharing #bringbackpaper! Oooh I’m all ready with my linkup… I’m very organised this time :). Lisa from Lisa’s Life recently posted…Woof Wednesday: 8 Sleeps Till Santa Paws!